Previously we saw that the Jordan Valley was once full of water. Now we ask, has the Dead Sea ever dried up completely? It appears that is has, but when? These are crucial and perplexing questions for believers in a global flood 4350 years ago (aka Noah’s Flood). Let’s look at this story more closely. The geological evidence that supports a once-dry Dead Sea is important, since it suggests that this is a possible future of the Dead Sea, and the countries around the Dead Sea are very much interested in the future of this water body. But I am more interested in the importance of this story with respect to the implications about the past. Specifically, how did this dried-down Dead Sea fit in the Biblical timeline, and what does it tell us about the age of the earth? A drilling barge in operation. Cores from the below the deepest portion of the Dead Sea were taken to document the history of the Dead Sea spanning up to 500,000 years. 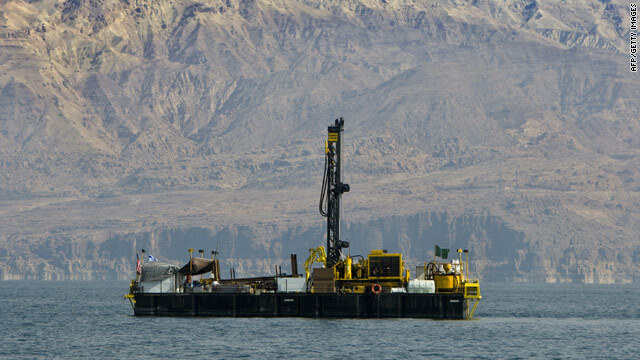 A research project called the Dead Sea Deep Drilling Project sought to recover a 2400-foot core of sediments from below the deepest part of the Dead Sea, for the purpose of reading the past history of the lake. An initial report in 2012 revealed one of the most significant findings of this project: the discovery that the Dead Sea has dried up in the past. The evidence of this great drying event was found in the cores at a depth of 770 feet below the bottom of the Dead Sea. What was found was a layer of pebbles, indicating the existence (long ago) of a shallow beach or streambed. Given its location in the center of this large lake and the lack of anything but fine sediments and crystalline precipitates in the rest of this core, this finding suggests that the lake was dried up and the remains of the Jordan River spilled out in what could have been a very small lake or just seasonal pool. But the pebbles were not all that was found. Just below the layer of pebbles was a whopping 150 foot thick section of nearly pure halite, also known as rock salt. Halite would have been produced by a lake of very high salt concentrations. This would only occur only if the Dead Sea had evaporated all the way down to a small pool. The 770 feet of laminated sediments above the pebbles tell a story of the refilling of the lake and thousands of seasonal cycles of evaporation and sediment inputs. How long ago did this happen? Geologists estimate that the pebble layer is about 120,000 years old, with the halite section sitting below it representing several thousand years of extreme aridity. The aridity allowed the Dead Sea to dry up, leaving only a heap of salts. At that point, the remains of the Dead Sea would have been well over 2000 feet below sea level! A Creationist’s Response to an Evaporated Dead Sea. Creationists who argue for a young-earth (less than 10,000 year old) believe the Dead Sea is at most 4350 years old, having its origins soon after a global flood devastated the surface of the earth. Thus far creationists have done little more than throw out a few hypotheses for how the Dead Sea could have formed in such a short time frame. Today I want to look at how one creationist’ spokesperson has attempted to accommodate the evidence of a dried up Dead Sea into the creationists timeline. The Institute for Creation Research (ICR) published a response to this Dead Sea report written by their “science” writer Brian Thomas. It pains me to put “science” in quotes, but I have to. Unfortunately, in his articles, Thomas demonstrates on a nearly daily basis that he either doesn’t do adequate research, doesn’t understand scientific research, or both. Thomas’ article on the Dead Sea does nothing to alter my impression of his abilities. Apparently, the evidence that the Dead Sea dried up is so compelling to Thomas that he doesn’t question its interpretation. But a dry Dead Sea begs an obvious question: Where does this dried up lake fit into the biblical timeline? Does the Bible record a time when the Dead Sea was nearly dried up, or does this event fall well before the history of man, as recorded in the Bible? For Thomas, the biblical timeline must include a catastrophic flood that occurred no more than 4350 years ago, so a completely dry Dead Sea must have occurred within the last five millennia. This is a just a tad bit different than the estimated time frame of the geologists who reported the dry Dead Sea at 120,000 years ago. So either the geologists or Brian Thomas is in serious error about the age of this dry Dead Sea. According to the Bible, in around 2000 B.C. what is now the Dead Sea used to be a plain that probably served as farmland for people of the nearby debauched city of Sodom. Genesis 14 first named the valley during the time of Abraham (then called Abram) as “the vale of Siddim, which is the salt sea.” So, the area was apparently a vale, or valley, but had been relabeled “the salt sea” by the time the original writings were edited and compiled, probably by Moses some 400 years after Abraham. First, Thomas assumes that the city of Sodom was located underneath the waters of the Dead Sea today, and that the people were farming in the nearby plain that stood in its place. It is not clear why he thinks that the current Dead Sea had to be completely evaporated for there to be room enough for a city and farmland. But, regardless, his explanation is nonsense, both scientifically and biblically. The news article that Thomas responds to is very clear that, for the Dead Sea to have dried up, the entire region would have to have been much hotter and drier than it is today. Obviously this would not be conducive to agricultural land or city living, not to mention that farmers at that time would have been farming on nearly pure salt deposits. How about some salty veggies! The researchers found the pebbles in the drill core beneath many storm and season-deposited layers of salt and mud that may represent a time before the Salt Sea’s existence—that is, before the destruction of Sodom and Gomorrah. This research demonstrating that the Dead Sea was indeed once a dry region supports the Bible as a trustworthy historical record. This interpretation is wrong in so many ways. Let’s take a look at a few of them, not just to correct Thomas but to help us better understand the history of the Dead Sea. Here’s the scenario that Thomas and I are dealing with. Two thousand feet of water need to have completely evaporated; assume no rain, no natural springs, and the Jordan River has been shut off. If all of these conditions were met, then a five-feet-per-year rate of water evaporation might be possible. Even under this extraordinary fast rate of evaporation, the Dead Sea would take 400 years to evaporate from its current levels much less the levels of Lake Lisan that we saw in the previous post (See Origins of the Dead Sea, Part IV). Yes, this fact greatly troubles Thomas’ timeline. For him, Noah’s flood occurred around 2350 BC. Abraham and Lot looked at the Dead Sea around 2000 BC and saw a well-watered valley. In Thomas’s chronology he has only 350 years to evaporate the Dead See down to approximately where we find it now after a global flood much less all the way down to nothing. After all this evaporation, which would have left a crust of salt, people decided to migrate to the lowest parts of this valley where there could be no “living” water. Here they built cities and began farming. How long would this urban and agricultural development have taken? Yes, this means that the Dead Sea would have evaporated, and then people settled the valley. Thomas’ timeline for the Dead Sea’s evaporation must be smaller, maybe much smaller, than 300 years. The natural conditions for the high rate of evaporation, which Thomas must assume, are unfathomable and seemingly impossible. 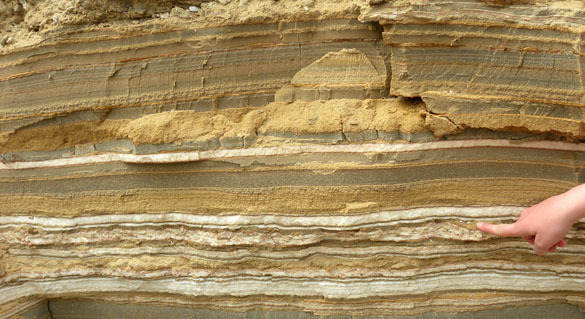 Dead Sea Sediments showing discreet bands of sediments deposited under changing conditions. In the image below white bands are mostly sodium chloride while others are calcium carbonate (aragonite) with some clay and other fine particulate layers. But this is just the beginning of the problems for Thomas’ Dead Sea story. Thomas doesn’t mention that below the 2400-foot core produced by the Deep Sea Drilling Project lies another 10,000+ feet of additional layers of sediments and salts. All of those sediments had to have been laid down by a lake in this valley before the sea dried down. When did this happen? Has Thomas considered where the 770 feet of sediment that now sits on top of the pebbles that formed that beach so long ago came from? Does he really think that Sodom and Gomorrah lie under hundreds of feet of sediments, representing thousands of thin layers of fine clays, halite and other precipitated minerals? 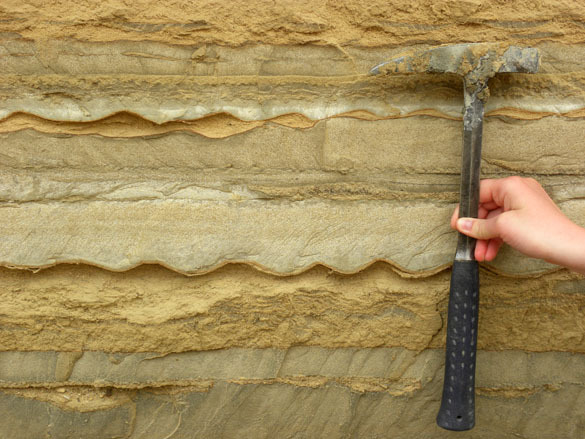 These layers show no signs of massive disruption, but rather they show continuous production of materials from a placid lake undergoing minor climatic variations over time. We are going to see in the next post that another creationist, Steve Austin, accepts that the last 4000 years of history are contained in just the top 18.5 feet of sediments of the Dead Sea. Austin also ignores the thousands of feet below these sediments, but he does have good reasons to believe that the 18.5 feet of sediments really do represent 4000 years. And yet Thomas, working for the same organization that published Austin’s paper two years earlier, makes a very different claim, while ignoring Austin’s paper. For Thomas, as we have seen, the sediments 770 feet below the bottom of the Dead Sea represent the same time period 4000 years ago when Sodom was destroyed. 770 feet or 18.5 feet? One or both of these creationists must be absolutely wrong, and they can’t both be right. I think Austin has it right, and I will explain why in the next post. This begs the question, did Thomas not read Austin’s better-researched paper? I suspect he didn’t, because had he done so he would have realized how ridiculous it would be for him to suggest that the destruction of Sodom and Gomorrah would be buried under 770 feet of layered sediments. His ideas are nothing more than knee-jerk speculation on a current geological story. He could have convinced himself that his speculation could not be true had he read a few papers on the geology of the Dead Sea region, and even his own colleague’s paper. This raises a difficult problem that ICR needs to address, but apparently has been unable or unwilling to fix going on several years now. The problem is that its main science writer is incompetent. Thomas is not even aware of articles written about the Dead Sea published by his own employer. I can’t find any reasonable excuse for this sort of incompetence, and I don’t understand how ICR can continue to accept the poor quality of this work. For the sake of maintaining any appearance of caring to publish accurate, well-researched commentaries on science stories, I would suggest that ICR needs to replace Thomas, or at least find an editor who can review his work prior to publication. I understand that the job of Thomas is to provide an alternative way to interpret current news stories to fit a young earth paradigm, and so I don’t expect him to admit that the data don’t support his overall worldview. But it is one thing to have a different interpretation of facts, and it is another to be unaware of basic information necessary to understanding a story, which leads to a wrong interpretation of the evidence. Unfortunately, Thomas is a trusted authority for many Christians who are looking for evidence that science supports their young-earth interpretation of the Bible. That trust is misplaced. Possible locations of Sodom and Gomorrah. There are many archaeological sites around the rim of the Dead Sea valley. Most of these are near natural springs or periodic streams. This makes more sense than at the bottom of the depression which would always be very salty and prone to flooding. Agriculture would not be possible at the lowest points but it possible in these soils higher up that have had some of the salts leached out of them. Thomas’s inability to recognize serious problems in his science isn’t his only problem. He isn’t much better at using the evidence that the Bible provides him. When Abraham comes to look over the Jordan Valley with Lot, what he sees is a well-watered valley. He doesn’t see a barren desert. If it was well-watered, why would Thomas expect that the Dead Sea dried up? There is nothing in the Bible that would give us any reason to believe that there was a time when the Dead Sea should be much smaller than it is now, much less completely dry. There are some radical, self-taught, and self-proclaimed Biblical “archaeologists” who have made wild claims about finding remains of Gomorrah under the Dead Sea. It appears that Thomas may be influenced by many of these spurious claims. Again, this is not a good precedent for a person who represents ICR and influences so many Christians. Did Thomas forget about his very own articles on the Biblical Ice Age? Yes. Or at least he didn’t connect his view of the Ice Age with his interpretation of an evaporated Dead Sea. Let’s look at why this is. Creationists, including Thomas, have promoted a singular Ice Age, which is said to have occurred over a few centuries after the global flood just 4350 years ago. For that time, they have predicted cooler temperatures and higher precipitation. This would have included the Middle East, with biblical proof for the Ice Age claimed to be found in the book of Job. In addition, the young-earth view also requires there to have been a much wetter time when the Sahara Desert was a vast productive grassland. This wet “desert” existed after a global flood, and it supported herds of cattle and thousands of nomadic peoples. For YECs, this period of wetness existed for several hundred years after the flood. Given these premises, it is ever more unlikely that the Dead Sea region would have experienced extreme drought during this time. Instead, creationists should expect the Dead Sea to have had elevated water levels during this period of time. Consider also that the young-earth model of the Dead Sea’s origin would predict that the entire Jordan Valley would have been filled with water after a global flood. How could all that water have evaporated down to nothing when temperatures were lower and precipitation higher than today? The lake levels should have been rising, not falling, during this time. It is especially hard to imagine that, as Thomas assumes, the Dead Sea Valley could dry up at an extraordinary rate during an age of increased rainfall and a lush Sahara Desert. In fact, there is abundant evidence from sediment cores from various locations in the Jordan Valley that the water levels were very high during a previous Ice Age. That Ice Age lake, called Lake Lisan, covered the entire valley including the Dead Sea and Sea of Galilee. 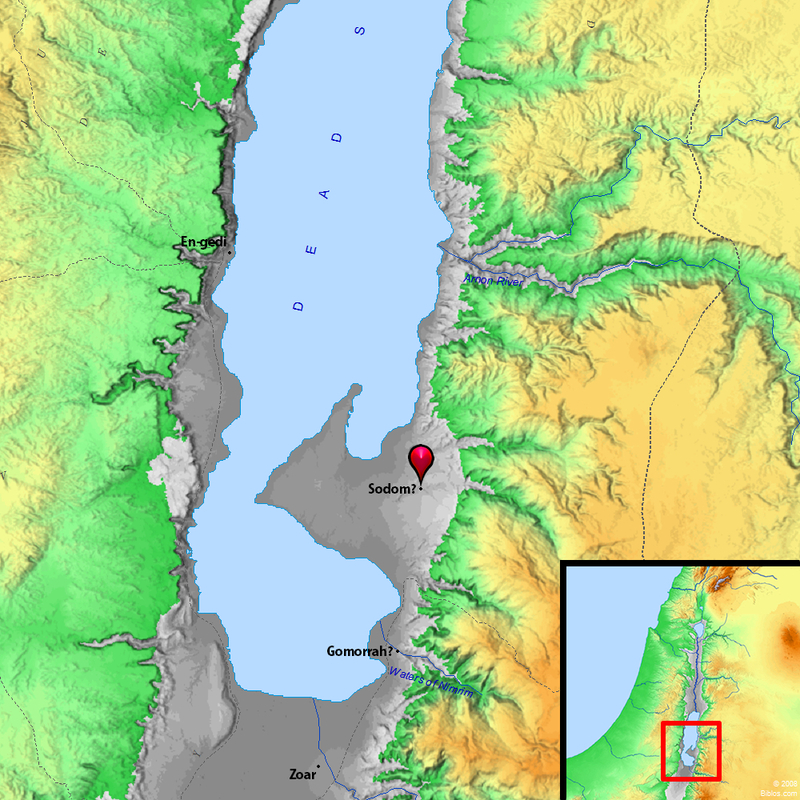 (See Part IV: Lake Lisan – The Jordan Valley Under Water) This lake is recorded in the sediment core recovered by the Dead Sea Drilling Project. There are many layers of clays in the upper portion of the core that represent a time when the waters of the lake were less salty and thus not precipitating minerals, which could then build up on the lake floor. These clay layers are completely consistent with a higher lake level during the last ice age, 15 to 40 thousand years ago. Consider that pebble layer and thick rock salt section of the core from below the Dead Sea again. The pebbles and thick rock salt portion of the core is found below the ice age deposits. So it represents a time much further in the past when the climate was much hotter and drier than it is today. Remember that Thomas wants the pebbles to represent a time that he believes the Bible mentions in Genesis, when the lake was much lower than today. Where does he think those layers of clays are that are above this portion of the column came from? All the references to the Dead Sea from the Bible – both the OT and NT – paint a picture of a Dead Sea that has not fluctuated more than a few hundred feet in level over several thousand years. I don’t know where Thomas thinks those 770 feet of sediments could have come from when the Dead Sea’s water level is known – based on biblical authority no less! – to have been quite stable for the last 4000 years. Gramling, C. Dead Sea Dried Up in Past. Science NOW. Posted on news.sciencemag.org December 7, 2011, accessed December 16, 2011. One borehole is not enough to prove all kinds of theories. To have a complete picture of what happened, you have to have a 3-Dimensional idea of the different layers underneath the dead sea. To find pebble stones on a bottum of a lake is very normal, they can be flushed in from a side stream. Also it is very possible that thick concentrated salt layers have a vulcanic origin, especially when sediment layers are absent and the salt is pure. The last bit of sea evaporising will not produce pure NaCl, but a mixture of different salts.